Do the election results matter? Or are investors just happy to see the election in the rearview mirror? 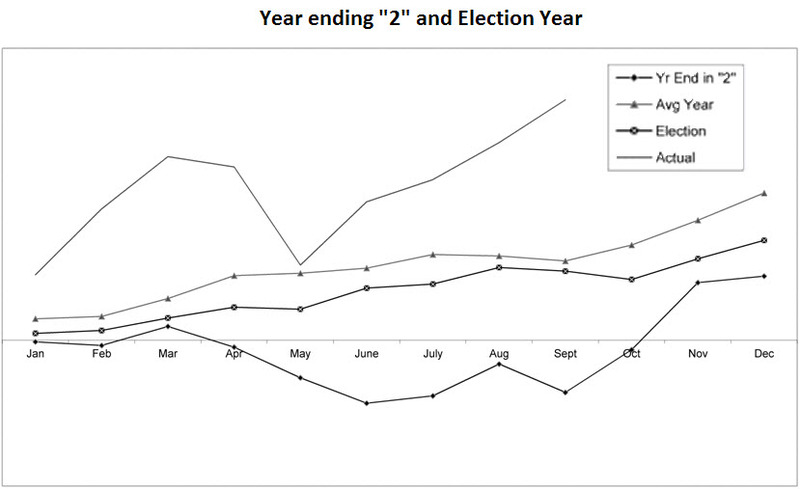 Everyone that follows seasonal and election patterns in the stock market have long recognized the election cycle is very positive in the year of an election. We’ll take a quick look at this year’s returns and how they have followed the historical pattern and what may occur not only through the rest of the year, but into the first quarter of next year. While there may not be many surprises, understanding history may help avoid errors in judgment. The data series I’m using goes back to the 1952 election or 15 complete election cycles. There are multiple data series, the first is the SP500 in an average year, the election cycle and finally years ending in “2”. Taking a look at each of the data points we’ll try to tease out some understanding of where the markets may be going based solely upon these cycles. First up is an average year. It should come as little surprise that the average overall returns are positive as the markets have historically moved higher roughly 2 of every three days and are significantly higher today than back in 1952. The total return of the market this year is certainly above the average return of 10%+ over the entire series, but does not look like stocks have followed a “normal” year. The best period of a normal year tends to be the fourth quarter and the first four months of the year. This has historically led to the mantra of selling in May and going away as well as buying in Sept/Oct. This year did not follow the plan entirely. The first four months of the year were very good, up 11%, even following a poor April. The decline in May got everyone excited about “selling in May”; however the markets rallied beginning in June and haven’t looked back. The correlation between the monthly returns for the SP500 and the average monthly returns is nearly zero, meaning very little of this year’s activity has followed the norm. Finally, in a “normal” year, the returns tend to be more volatile in the final four months of the year. Again, the markets have not yet followed the normal year, but may yet do so. So this year isn’t too average. What about years ending in “2”? The decade calendar has a few interesting patterns, from 6 for 6 very positive returns for years ending in “5” to very volatile years ending in “8”. Unfortunately with only six prior years ending in “2” to compare to this year, the analysis suffers from too few data points to be truly meaningful. That said, the markets have followed more closely the pattern of the prior “2” years. The worst month historically is May, as it was this year. The best months are back end loaded, with August through December seeing only one negative month. Using the prior six years ending in “2”, the best two months are actually October and November. Having skated by the usually poor September and (so far) October, this cycle would point to a very good final two months of the year. Finally, let’s look at the election cycle itself. The markets tend to have their worst two years early in an administration as they try to get all the bad stuff out of the way and begin “pumping” the economy in the year prior to the election. The Obama presidential cycle has been well off of the norm, likely as a result of the financial crisis beginning late in 2007. The best returns were in the first two years of Obama’s administration, while last year was supposed to be the barn burner but finished nearly unchanged. As far as 2012 is unfolding, it is the worst of all in following the historical cycle. According to history, the worst months of the year have been Feb, Sept and October. This year, each of the months (so far) are positive. Historically the three best months are June, Nov, Dec. June did follow the historical trends. Given that the trend this year has very close to a zero correlation to the historical trend, it leaves the door open for a surprise toward yearend. Of course that surprise may be in the form of political positioning anticipating the fiscal cliff. No matter how the year finishes out, early next year could be interesting. Again, using historical data for years ending in “3” and the first presidential year show a relatively weak first quarter (even after adjusting for the terrible early ’09). So what does that mean for the crystal ball? Given the fairly low correlation this year to the historical trends, it could be a rougher post election period into the first quarter of 2013. Since the first two years also tend to be rather poor, the markets may struggle into the typically strong third year. The chart below shows the various average markets for this year. While the past never repeats, it does tend to rhyme. Hopefully this exercise highlights some of the realities of investing based upon “the cycles”.